Sen. Elizabeth Warren announced her candidacy for president on Feb. 9. President Donald Trump criticized Warren in a tweet for identifying as Native American. Warren apologized for previously identifying as Native American on Feb. 5. Sen. Elizabeth Warren (D-Mass.) announced she was running for president in 2020 at a rally in Lawrence, Massachusetts on Feb. 9. Warren’s heritage has long been a point of speculation for Trump, who has publicly mocked her, calling her “Pocahontas.” Trump, who has a penchant for bestowing demeaning monikers, once offered to administer a DNA test to Warren in exchange for a $1 million charitable donation. On Feb. 5, Warren “apologized for previously identifying as Native American” in an interview with the Washington Post. As with most candidates, her finances will likely come under more detailed scrutiny after announcing her run. Here’s a look at the senator’s earnings. Elizabeth Warren’s net worth was estimated to be between $7.8 million, according to OpenSecrets, and $8.75 million, according to CNN, in 2015. Celebrity Net Worth currently pegs her in between those figures at $8 million. As one of Trump’s most vocal Democratic adversaries, Warren introduced the Anti-Corruption and Public Integrity Act in Washington in August 2018. The law would require all congressional candidates to release the two most recent years of tax returns. Warren herself released 10 years’ worth of state and federal tax returns a day after proposing the new law. Her disclosure revealed a combined gross income of $913,000 in 2017 between her and husband Bruce Mann. Warren’s reported salary as a U.S. senator is a modest $174,000 compared with the $430,370 she earned as a best-selling author. Also in 2017, the couple donated $82,000 — about 9 percent of their earnings — to charities. Before she was an elected official, Warren grew up in a family “hanging on by their fingernails to their place in the middle class,” according to her official website. Saddled with family financial hardships, Warren received a scholarship to George Washington University but dropped out to get married at age 19. She later returned to college and continued on to law school. 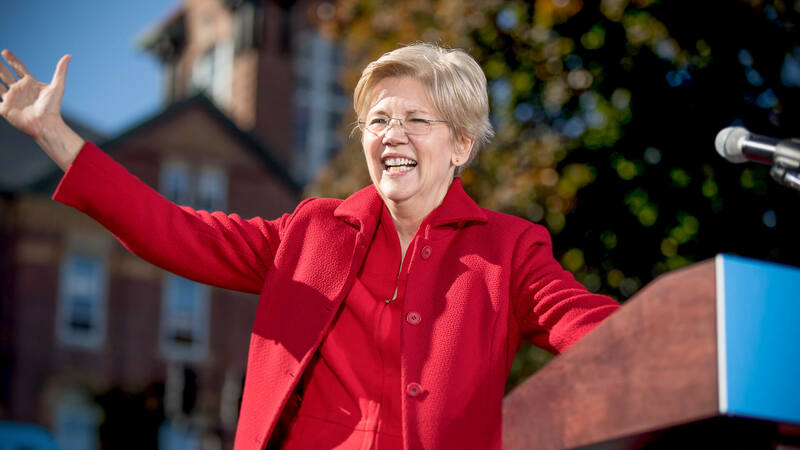 Warren left her law practice and began teaching law at her alma mater, Rutgers Law School. From there, Warren and her husband, a Massachusetts native, moved to Cambridge, where Warren taught at Harvard Law School. Warren has served as Massachusetts’ senior senator since 2013. During her tenure in the Senate, Warren has opposed big banks, fraudulent lenders and for-profit educational institutions. Education: Attended George Washington University, University of Houston, B.A., Rutgers University, J.D. Figures are accurate as of Oct. 15, 2018. The justice returns to the Supreme Court following her surgery.